This 5-day adventure tour combines recreational mountain biking with white-water rafting in Costa Rica. The itinerary includes guided rides on scenic secondary roads, while exploring active volcanoes, coffee plantations, tropical rivers, lowland rainforests, and beaches along the way. Biking distance is about 50 miles (80 kilometers), with 70% of the travel involving gravel and dirt roads, 20% paved roads, and 10% single track. You’ll also go white-water rafting in the Pacuare River, which boasts Class III and IV rapids. Let me start by saying this was a once in a lifetime experience, the trip is local, the people you meet are exceptional and the experience “priceless”. The journey started with pick up from our hotel outside of San Jose, where we were greeted by our super energetic tour guide “Diego” AlvGamb, and then by the best driver in San Jose, “Miguel” Alberto Zuñiga Baldizon and within a few minutes we loaded our packs into the car and we were off. We drove about 16 miles outside of SJO and began biking near Cartago, our first stop in was the Basilica of our ladies of the Angels. Then onto Orosi church, we then biked into town to watch a local football game. From there we drove to the first lodge located in Jimenez, called “La Fonda Del Alto”. Where we were greeted by a daughter and mom (Rosi) duo, who made a 4 course local dinner, and in the morning a traditional Costa Rican breakfast, yum! After breakfast, we started biking to lake Cachi, where we saw the Hydroelectric Power Station, exceptional. We then biked about 2 miles to met our driver “Miguel” for some local tailgate eats that included exotic fruits and chocolates. After the tailgate eats we biked to a nearby town of Turrialba, where we took in part of a local soccer game. From here, we rode to a river bank where we jumped off the bikes, climbed down to the river, dipped our feet in, skipped stones, built rock towers. We cannot thank Diego and Miguel for taking us to this special location, it’s a memory to last a lifetime. 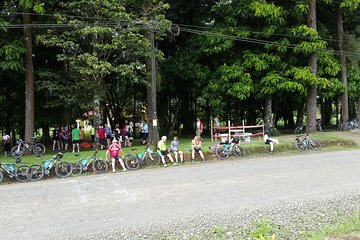 We then biked to a local eatery that overlooks Turrialba, the plantains with honey and Turrialba cheese, delicious! As the sun went down, we headed to the Guaybo Lodge, located on the slopes of the Turrialba volcano. The next morning, we headed to the Paquette River for some white water rafting, where we met Carlos, after some the instruction, the 4 of us loaded into a raft and began the 4 hour journey down river, we stopped for a surprise lunch located in a eco friendly lodge. After some delicious food and jungle walks, we headed back the raft and started paddling. The evening came and we checked into our final hotel, the Cahuita Inn, In the morning, we went on a local 3+ hour chocolate tour at “Cacao-trails” a must do. The next morning, we gave thanks and said our goodbye’s to our amazing tour guide Diego and headed off to the pacific side with Miguel. On the drive, Miguel stopped to show us a few sites, as we drove through the winding streets. Miguel and Diego, you are both amazing!